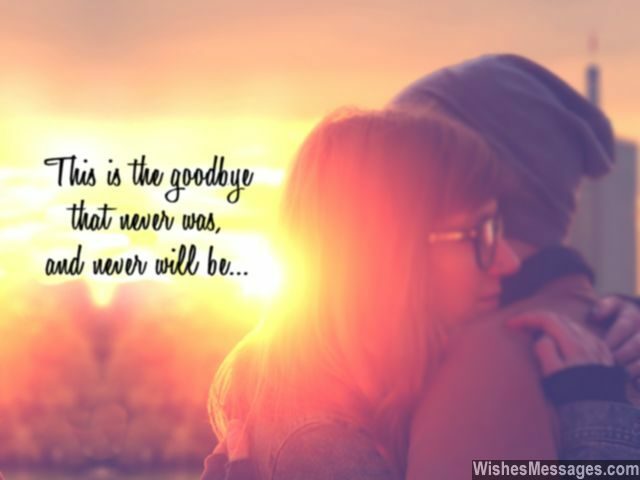 Goodbye Messages for Boyfriend: The hardest goodbyes often become the best memories. Dig deep in your heart and scribble out a sweet quote on a note or a letter. Give it to him when you share your last hug and kiss before he leaves. Rant it out on Facebook and Twitter. Share it on Pinterest. Do all it takes to let him know that his girl will be heartbroken, and desperately waiting for him to come back. Whether your guy is going interstate for college, overseas for work, moving cities or preparing for deployment in the forces – let your tears and heartbeats do the talking. Clinch on to the precious memories as you both make promises to each other. Goodbyes are hard but if you really believe in your relationship and love, express yourself and hold on tight till you are back together again. 2) Every time you miss me just close your eyes, breathe deeply and put your hand on your chest – you will hear my heart beating inside. Goodbye. 4) As you leave, you are taking with you a piece of my heart, a part of my soul, a chunk of my mind and all of my happiness. Goodbye. 5) I’ll just sit here and watch you walk away, while I hold on to the memories we’ve made till this day. Goodbye. 6) The thought of you going away makes me think about all the times when I could have said how much I love you… but I didn’t. I will miss you, goodbye. 7) We will be thousands of miles apart but all I want you to remember is that I am not just your girlfriend – I am a girl whose only dream is that yours come true. Goodbye. 8) I’ll be right here, clutching on to the precious memories, desperately waiting for you to come back so we can make more. Goodbye. 9) Our lives and our relationship will go on even though you are leaving. But every single step of the way will feel like walking on sharp pieces of glass. I will keep walking even though my feet bleed, until we are together again. Goodbye. 10) I will survive, but life won’t be worth living. Goodbye. 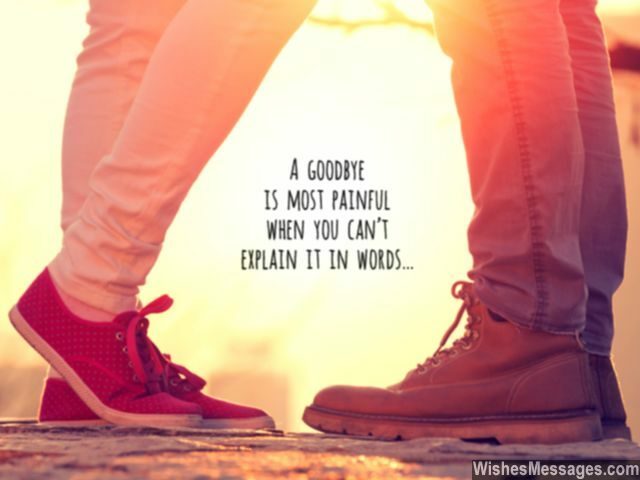 11) A goodbye is most painful when you can explain it in words. 12) The key to a great long distance relationship is the boyfriend’s will to not look at other girls while he is away. Remember this, goodbye. 13) I won’t say a word. I want you to see the tears in my eyes and feel the throb of my heart. Goodbye. 14) I don’t know how I will survive without the boy who makes me giggle, smile, laugh and melt from inside like gooey chocolate. Goodbye. 15) I will wait for the day when I hear your voice call out my name and I see you standing at my door. Until then, I hope you hear my heart weep and see me looking outside my bedroom window desperately waiting for you, dreaming about you and missing you from the bottom of my heart. Goodbye. 17) The best thing is that I have never loved anyone the way I have loved you. 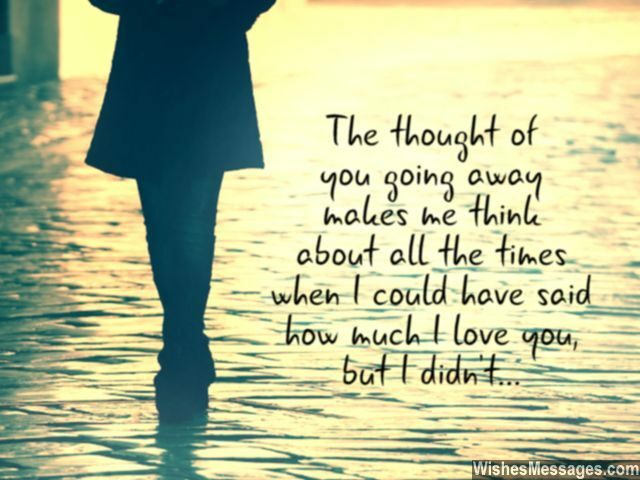 The worst thing is that I will miss you in a way that I have never missed anyone. Goodbye. 18) Days will pass by, but my tears won’t dry. My heart will continue to pain, until the day we meet again. Goodbye. 19) I know that everything happens for a reason, but I desperately hope that this reason is worth the wait. Come back soon, goodbye. 20) No matter where you go, no matter where you are – always remember that there is this girl who is waiting for you to come back and take her into your arms. Goodbye. 23) No matter how far we are apart, nothing can ever come between us – you will always be just a heartbeat away. Goodbye. 24) As college takes us separate ways, let’s make a pact – we will both study hard and ace all semesters so that we can graduate, move to the same city, rent a cozy apartment in downtown and sip coffee by the window, thinking about how beautiful life has been to us. I love you boy, goodbye. 25) I know I can’t stop you from leaving, but I can’t stop myself from crying. But I won’t let you see my tears, because I don’t want you to stop smiling. Goodbye. 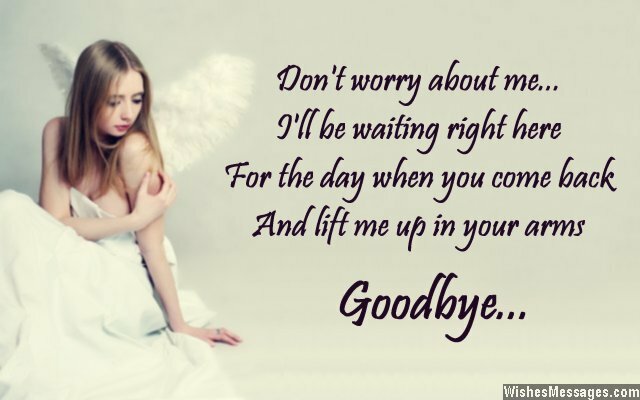 26) Don’t worry about me, I will be waiting right here for the day when you come back and lift me up in your arms. Goodbye. 27) I know you will come back soon, but that moment seems as far as from here to the moon. You have no idea how much I am going to miss you, my whole world is going to be immersed in a sad hue. Goodbye. 28) I will cry but I will never let you hear my sobs. I will be sad but I will never let you feel my sadness. I will not be happy without you but I will never let that dampen your happiness. Goodbye. 29) This is one of those moments in life where the grief of a GOODBYE is more powerful than the happiness of an I LOVE YOU. Come back soon, goodbye. 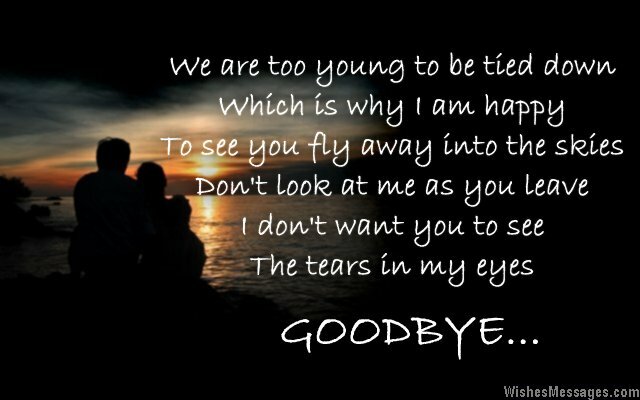 30) I won’t look into your eyes when you leave because I don’t want to see my dreams walking away. Goodbye. 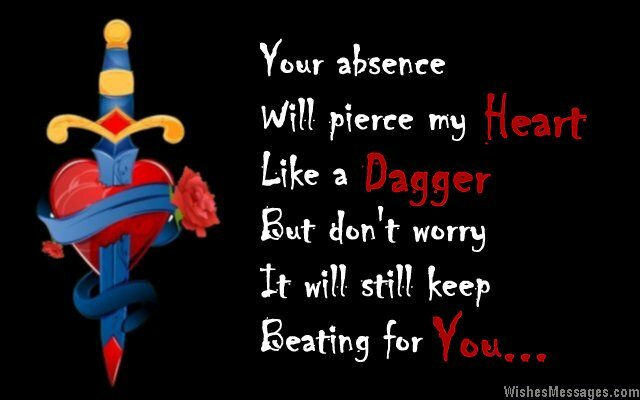 31) Your absence will pierce my heart like a dagger. But don’t worry, it will still keep beating for you. Goodbye. 32) I will miss the boy who called me My Girl, and who I called My Love. Goodbye. 33) I will convince my heart that you are going to go away for some time. But who will convince my arms that they won’t get your hugs? Goodbye. 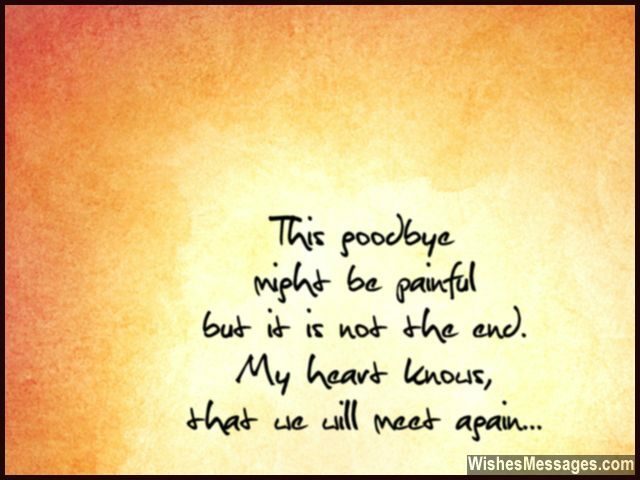 34) Saying goodbye to my boyfriend is like an injury that happens fast but pains for a long time. 35) I don’t LIKE watching you leave but I don’t want to stop you from doing what you LIKE. Goodbye. 36) We are too young to be tied down, which is why I am happy to see you fly away into the skies. Don’t look at me as you leave, I don’t want you to see the tears in my eyes. Goodbye. 37) I am happy that you are going away to pursue your dreams but there is a part of me that wants you to stay back and sit right here beside me. I’ll miss ya, goodbye. 38) Don’t feel sorry for me as you leave. My life will be just the same – dreaming about the day we can be together forever. I love you, goodbye. 39) As we go separate ways to chase our dreams, I hope you achieve all your dreams of which I am a part of. Goodbye. 40) You are not walking out of my life but if you are going to be staying away, I don’t know what my life is. Goodbye.